11 A None No Power Seat 11 A is a standard Business Class bulkhead seat, although proximity to the lavatories and galley may be bothersome. Passengers traveling with infants are often seated in this row. 11 D None No Power Seat 11 D is a standard Business Class bulkhead seat, although proximity to the lavatories and galley may be bothersome. Passengers traveling with infants are often seated in this row. 11 F None No Power Seat 11 F is a standard Business Class bulkhead seat, although proximity to the lavatories and galley may be bothersome. Passengers traveling with infants are often seated in this row. 11 K None No Power Seat 11 K is a standard Business Class bulkhead seat, although proximity to the lavatories and galley may be bothersome. Passengers traveling with infants are often seated in this row. 16 A None No Power Seat 16 A is a standard Business Class seat that is missing a window. 16 K None No Power Seat 16 K is a standard Business Class seat that is missing a window. 20 A None No Power Seat 20 A is a standard Business Class seat, although proximity to the galley and lavatory may be bothersome. 20 D None No Power Seat 20 D is a standard Business Class seat, although proximity to the galley and lavatory may be bothersome. 20 F None No Power Seat 20 F is a standard Business Class seat, although proximity to the galley and lavatory may be bothersome. 20 K None No Power Seat 20 K is a standard Business Class seat, although proximity to the galley and lavatory may be bothersome. 41 A None No Power Seat 41 A is a standard Economy seat that Singapore Air designates as a "Forward Zone Seat". Forward Zone Seats enable you to be among the first in Economy Class to disembark the plane. You may select these seats in advance for free when you book a Flexi fare type. When you book a Lite or Standard fare type, there is an additional fee for this seat. The proximity to the lavatories and galley may be bothersome. Passengers traveling with infants are often seated in this row. There is no floor storage for this seat during takeoff and landing. The tray table and inflight entertainment monitor are in the armrest, making the armrest immovable and slightly reducing seat width. 41 B None No Power Seat 41 B is a standard Economy seat that Singapore Air designates as a "Forward Zone Seat". Forward Zone Seats enable you to be among the first in Economy Class to disembark the plane. You may select these seats in advance for free when you book a Flexi fare type. When you book a Lite or Standard fare type, there is an additional fee for this seat. The proximity to the lavatories and galley may be bothersome. Passengers traveling with infants are often seated in this row. There is no floor storage for this seat during takeoff and landing. The tray table and inflight entertainment monitor are in the armrest, making the armrest immovable and slightly reducing seat width. 41 C None No Power Seat 41 C is a standard Economy seat that Singapore Air designates as a "Forward Zone Seat". Forward Zone Seats enable you to be among the first in Economy Class to disembark the plane. You may select these seats in advance for free when you book a Flexi fare type. When you book a Lite or Standard fare type, there is an additional fee for this seat. The proximity to the lavatories and galley may be bothersome. Passengers traveling with infants are often seated in this row. There is no floor storage for this seat during takeoff and landing. The tray table and inflight entertainment monitor are in the armrest, making the armrest immovable and slightly reducing seat width. 41 D None No Power Seat 41 D is a standard Economy seat that Singapore Air designates as a "Forward Zone Seat". Forward Zone Seats enable you to be among the first in Economy Class to disembark the plane. You may select these seats in advance for free when you book a Flexi fare type. When you book a Lite or Standard fare type, there is an additional fee for this seat. The proximity to the lavatories and galley may be bothersome. Passengers traveling with infants are often seated in this row. There is no floor storage for this seat during takeoff and landing. The tray table and inflight entertainment monitor are in the armrest, making the armrest immovable and slightly reducing seat width. 41 E None No Power Seat 41 E is a standard Economy seat that Singapore Air designates as a "Forward Zone Seat". Forward Zone Seats enable you to be among the first in Economy Class to disembark the plane. You may select these seats in advance for free when you book a Flexi fare type. When you book a Lite or Standard fare type, there is an additional fee for this seat. The proximity to the lavatories and galley may be bothersome. Passengers traveling with infants are often seated in this row. There is no floor storage for this seat during takeoff and landing. The tray table and inflight entertainment monitor are in the armrest, making the armrest immovable and slightly reducing seat width. 41 G None No Power Seat 41 G is a standard Economy seat that Singapore Air designates as a "Forward Zone Seat". Forward Zone Seats enable you to be among the first in Economy Class to disembark the plane. You may select these seats in advance for free when you book a Flexi fare type. When you book a Lite or Standard fare type, there is an additional fee for this seat. The proximity to the lavatories and galley may be bothersome. Passengers traveling with infants are often seated in this row. There is no floor storage for this seat during takeoff and landing. The tray table and inflight entertainment monitor are in the armrest, making the armrest immovable and slightly reducing seat width. 41 H None No Power Seat 41 H is a standard Economy seat that Singapore Air designates as a "Forward Zone Seat". Forward Zone Seats enable you to be among the first in Economy Class to disembark the plane. You may select these seats in advance for free when you book a Flexi fare type. When you book a Lite or Standard fare type, there is an additional fee for this seat. The proximity to the lavatories and galley may be bothersome. Passengers traveling with infants are often seated in this row. There is no floor storage for this seat during takeoff and landing. The tray table and inflight entertainment monitor are in the armrest, making the armrest immovable and slightly reducing seat width. 41 J None No Power Seat 41 J is a standard Economy seat that Singapore Air designates as a "Forward Zone Seat". Forward Zone Seats enable you to be among the first in Economy Class to disembark the plane. You may select these seats in advance for free when you book a Flexi fare type. When you book a Lite or Standard fare type, there is an additional fee for this seat. The proximity to the lavatories and galley may be bothersome. Passengers traveling with infants are often seated in this row. There is no floor storage for this seat during takeoff and landing. The tray table and inflight entertainment monitor are in the armrest, making the armrest immovable and slightly reducing seat width. 41 K None No Power Seat 41 K is a standard Economy seat that Singapore Air designates as a "Forward Zone Seat". Forward Zone Seats enable you to be among the first in Economy Class to disembark the plane. You may select these seats in advance for free when you book a Flexi fare type. When you book a Lite or Standard fare type, there is an additional fee for this seat. The proximity to the lavatories and galley may be bothersome. Passengers traveling with infants are often seated in this row. There is no floor storage for this seat during takeoff and landing. The tray table and inflight entertainment monitor are in the armrest, making the armrest immovable and slightly reducing seat width. 47 A None No Power Seat 47 A is a standard Economy seat that Singapore Air designates as a "Forward Zone Seat". Forward Zone Seats enable you to be among the first in Economy Class to disembark the plane. You may select these seats in advance for free when you book a Flexi fare type. When you book a Lite or Standard fare type, there is an additional fee for this seat. 47 B None No Power Seat 47 B is a standard Economy seat that Singapore Air designates as a "Forward Zone Seat". Forward Zone Seats enable you to be among the first in Economy Class to disembark the plane. You may select these seats in advance for free when you book a Flexi fare type. When you book a Lite or Standard fare type, there is an additional fee for this seat. 47 C None No Power Seat 47 C is a standard Economy seat that Singapore Air designates as a "Forward Zone Seat". Forward Zone Seats enable you to be among the first in Economy Class to disembark the plane. You may select these seats in advance for free when you book a Flexi fare type. When you book a Lite or Standard fare type, there is an additional fee for this seat. 47 D None No Power Seat 47 D is a standard Economy seat that Singapore Air designates as a "Forward Zone Seat". Forward Zone Seats enable you to be among the first in Economy Class to disembark the plane. You may select these seats in advance for free when you book a Flexi fare type. When you book a Lite or Standard fare type, there is an additional fee for this seat. 47 E None No Power Seat 47 E is a standard Economy seat that Singapore Air designates as a "Forward Zone Seat". Forward Zone Seats enable you to be among the first in Economy Class to disembark the plane. You may select these seats in advance for free when you book a Flexi fare type. When you book a Lite or Standard fare type, there is an additional fee for this seat. 47 G None No Power Seat 47 G is a standard Economy seat that Singapore Air designates as a "Forward Zone Seat". Forward Zone Seats enable you to be among the first in Economy Class to disembark the plane. You may select these seats in advance for free when you book a Flexi fare type. When you book a Lite or Standard fare type, there is an additional fee for this seat. 47 H None No Power Seat 47 H is a standard Economy seat that Singapore Air designates as a "Forward Zone Seat". Forward Zone Seats enable you to be among the first in Economy Class to disembark the plane. You may select these seats in advance for free when you book a Flexi fare type. When you book a Lite or Standard fare type, there is an additional fee for this seat. 47 J None No Power Seat 47 J is a standard Economy seat that Singapore Air designates as a "Forward Zone Seat". Forward Zone Seats enable you to be among the first in Economy Class to disembark the plane. You may select these seats in advance for free when you book a Flexi fare type. When you book a Lite or Standard fare type, there is an additional fee for this seat. 47 K None No Power Seat 47 K is a standard Economy seat that Singapore Air designates as a "Forward Zone Seat". Forward Zone Seats enable you to be among the first in Economy Class to disembark the plane. You may select these seats in advance for free when you book a Flexi fare type. When you book a Lite or Standard fare type, there is an additional fee for this seat. 56 C None No Power Seat 56 C is a standard Economy Class seat, however, the proximity to the lavatory may be bothersome. 56 D None No Power Seat 56 D is a standard Economy Class seat, however, the proximity to the lavatory may be bothersome. 56 E None No Power Seat 56 E is a standard Economy Class seat, however, the proximity to the lavatory may be bothersome. 56 G None No Power Seat 56 G is a standard Economy Class seat, however, the proximity to the lavatory may be bothersome. 56 H None No Power Seat 56 H is a standard Economy Class seat, however, the proximity to the lavatory may be bothersome. 57 A None No Power Seat 57 A is a standard Economy Class seat that may have limited recline due to the Exit Row. The proximity to the lavatory may be bothersome. 57 B None No Power Seat 57 B is a standard Economy Class seat that may have limited recline due to the Exit Row. The proximity to the lavatory may be bothersome. 57 C None No Power Seat 57 C is a standard Economy Class seat that may have limited recline due to the Exit Row. The proximity to the lavatory may be bothersome. 57 H None No Power Seat 57 H is a standard Economy Class seat that may have limited recline due to the Exit Row. The proximity to the lavatory may be bothersome. 57 J None No Power Seat 57 J is a standard Economy Class seat that may have limited recline due to the Exit Row. The proximity to the lavatory may be bothersome. 57 K None No Power Seat 57 K is a standard Economy Class seat that may have limited recline due to the Exit Row. The proximity to the lavatory may be bothersome. 58 A None No Power Seat 58 A is a standard Economy seat that has additional legroom due to the Exit Row. There is no floor storage for this seat during takeoff and landing. The tray table and inflight entertainment monitor are in the armrest, making the armrest immovable and slightly reducing seat width. 58 B None No Power Seat 58 B is a standard Economy seat that has additional legroom due to the Exit Row. There is no floor storage for this seat during takeoff and landing. The tray table and inflight entertainment monitor are in the armrest, making the armrest immovable and slightly reducing seat width. 58 C None No Power Seat 58 C is a standard Economy seat that has additional legroom due to the Exit Row. There is no floor storage for this seat during takeoff and landing. The tray table and inflight entertainment monitor are in the armrest, making the armrest immovable and slightly reducing seat width. 58 D None No Power Seat 58 D is a standard Economy seat that has additional legroom due to the Exit Row, however, the proximity to the lavatory may be bothersome. Passengers traveling with infants are often seated in this seat. There is no floor storage for this seat during takeoff and landing. The tray table and inflight entertainment monitor are in the armrest, making the armrest immovable and slightly reducing seat width. 58 E None No Power Seat 58 E is a standard Economy seat that has additional legroom due to the Exit Row, however, the proximity to the lavatory may be bothersome. Passengers traveling with infants are often seated in this seat. There is no floor storage for this seat during takeoff and landing. The tray table and inflight entertainment monitor are in the armrest, making the armrest immovable and slightly reducing seat width. 58 G None No Power Seat 58 G is a standard Economy seat that has additional legroom due to the Exit Row, however, the proximity to the lavatory may be bothersome. Passengers traveling with infants are often seated in this seat. There is no floor storage for this seat during takeoff and landing. The tray table and inflight entertainment monitor are in the armrest, making the armrest immovable and slightly reducing seat width. 58 H None No Power Seat 58 H is a standard Economy seat that has additional legroom due to the Exit Row. There is no floor storage for this seat during takeoff and landing. The tray table and inflight entertainment monitor are in the armrest, making the armrest immovable and slightly reducing seat width. 58 J None No Power Seat 58 J is a standard Economy seat that has additional legroom due to the Exit Row. There is no floor storage for this seat during takeoff and landing. The tray table and inflight entertainment monitor are in the armrest, making the armrest immovable and slightly reducing seat width. 58 K None No Power Seat 58 K is a standard Economy seat that has additional legroom due to the Exit Row. There is no floor storage for this seat during takeoff and landing. The tray table and inflight entertainment monitor are in the armrest, making the armrest immovable and slightly reducing seat width. 69 A None No Power Seat 69 A is a standard Economy Class seat that is missing a window. 69 K None No Power Seat 69 K is a standard Economy Class seat that is missing a window. 73 A None No Power Seat 73 A is a standard Economy Class seat that is located in the last row of the aircraft and may have limited recline. The proximity to the lavatories may be bothersome. 73 B None No Power Seat 73 B is a standard Economy Class seat that is located in the last row of the aircraft and may have limited recline. The proximity to the lavatories may be bothersome. 73 C None No Power Seat 73 C is a standard Economy Class seat that is located in the last row of the aircraft and may have limited recline. The proximity to the lavatories may be bothersome. 73 D None No Power Seat 73 D is a standard Economy Class seat. The proximity to the lavatories might be bothersome. 74 D None No Power Seat 74 D is a standard Economy Class seat that is located in the last row of the aircraft and may have limited recline. The proximity to the lavatories may be bothersome. 74 E None No Power Seat 74 E is a standard Economy Class seat that is located in the last row of the aircraft and may have limited recline. The proximity to the lavatories may be bothersome. 74 G None No Power Seat 74 G is a standard Economy Class seat that is located in the last row of the aircraft and may have limited recline. The proximity to the lavatories may be bothersome. 74 H None No Power Seat 74 H is a standard Economy seat. The proximity to the lavatory may be bothersome. 75 H None No Power Seat 75 H is a standard Economy Class seat that is located in the last row of the aircraft and may have limited recline. The proximity to the lavatories may be bothersome. 75 K None No Power Seat 75 K is a standard Economy Class seat that is located in the last row of the aircraft and may have limited recline. The proximity to the lavatories may be bothersome. 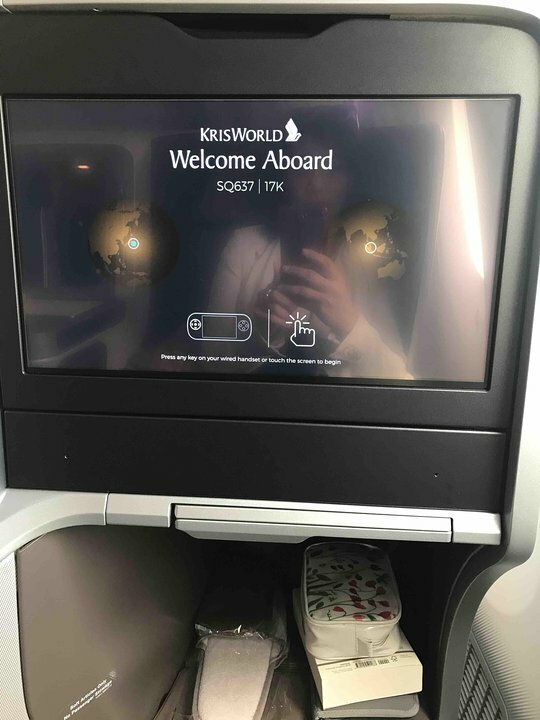 Singapore Airlines' upgraded KrisWorld entertainment system offers 100 movies and 180 television programs OnDemand, as well as games and other entertainment options. Each Business Class seat has a 23.0" flat screen and comes equipped with a tablet stand integrated into the tray table. Each Economy Class seat has their own 10.6" personal TVs. Each Business Class seat on this aircraft has a 110v AC power port as well as a USB port. Each Economy Class seat has a 110v AC power port between seats. The 787-10 is the longest variant of Boeing’s Dreamliner range of aircraft, which are constructed using technologically advanced lightweight composite materials. Singapore Airlines flies the Boeing 787-10 in a two class configuration. There are 36 Business Class seats and 301 Economy Class seats for a total of 337 seats. Good seat, window next to the seat, quite good food. 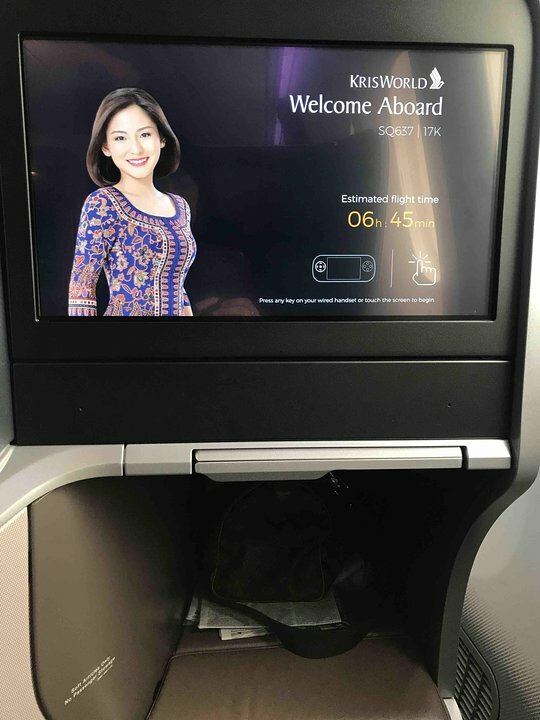 Flying economy on the new B787-10 from SIN to BKK was really great! The seat is wide, foot length is pretty good and the entertainment option is one if the best. The TV screen is easily 19 inch! The head rest is adjustable as well somit can slide up and down to fit your head whether you are tall or short. Paid for Extra Legroom seat at 58H on a night flight hoping to get some sleep. It was a terrible experience as the toilet was nearby and constantly a lot of people queueing for the toilet. On top of that, there was an stench that never dissipate. 787-10 is my least favorite flight. Definitely the worst seat on the aircraft although its the 1st row with the biggest legroom in economy. The worst because the front wall stops at B, so there is front wall only for A & B seats. If you take the aisle seat C, then half your seat is in the path of all people walking. Therefore, all the crew, passengers, and the trollies will be hitting your foot when you stretch out especially on a night flight. The seat seemed to be narrower then regular SQ seats. Rest of the 1st row seats are OK, just avoid the aisle seats on the widow sides. These seats are nowhere near 30in wide. My shoulders were rubbing both sides of the seat enclosure, which was not a problem at all in the A350, which supposedly only has 28in wide seats. 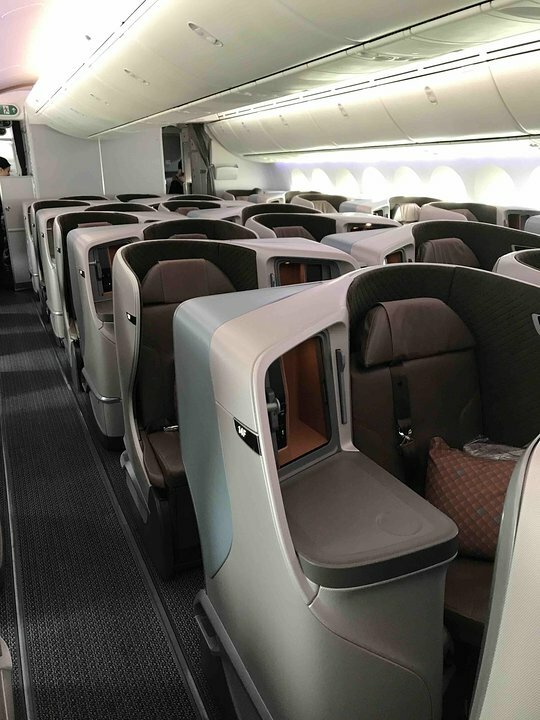 These seats are much more "standard" business class seats, in the sense that you can recline down into a bed, rather than having to fold them forward to turn the seat into a bed. Besides the narrowness of the seats, they're quite comfortable and the tray table is much better located than on the A350. However, the foot cubbie is still tiny, but very deep. This means you get "stuck" when sleeping, which can be quite painful when you wake up. The flight I was on already showed a lot of wear and tear, which was quite surprising, as these planes are brand new. Once seated, you notice the high-density, thinner seat cushions, which give you more perceived legroom than the standard 32 in pitch would suggest. Because SQ stayed with the 3-3-3 configuration, the seat width has to be narrower than the comparable A330 or B777 experience, and I certainly felt this was the case, despite the very narrow armrests. Certainly the aisles are narrow, and in the aisle seat, I was constantly jostled by passengers and assorted bags during the boarding process. I also found it hard to get comfortable on the thinner seats, though this was less of an issue for a short-haul flight. Aircraft crowded. Poor/indifferent cabin service. Flight departed very late; meal service even later. Meal choice disappeared before this row in cabin. Seat close to toilets - can always hear flushing. Seat itself OK, but impossible to get out unless you can persuade both 56B and 56C to stand up and move first. I prefer the A350-900. Dreamliner remains Dreamliner and this aircraft is not really made for 3-3-3 config in economy class, because all seats get narrow compared to an A350 for example. But you have to give credits to Singapore Airlines, because they did a good job on the 787 cabin compared to other airlines. Yes, the seat could be wider but at least I could avoid the shoulder-to-shoulder feeling when i was in the middle of 3 guys. 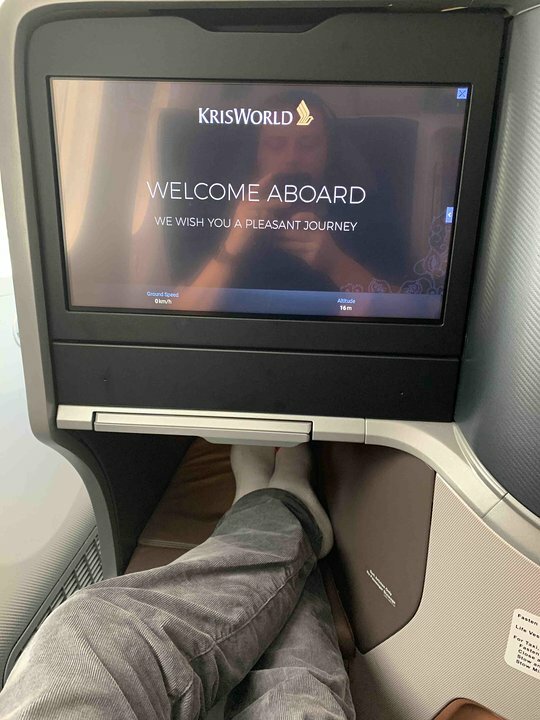 The legroom is very decent and with my 1.98m size I even could put my legs under the seat in front and stretch and that´s something I can´t do everywhere. Also the ergonomic form of the seat makes it feel well sitting in there. So compared to other 787 experiences on other airlines SQ was so far the best Dreamliner trip I had in economy. On another flight I had 58B and this emergency exit row seat is too narrow. Don´t want to have this one again although you have more space to stretch. 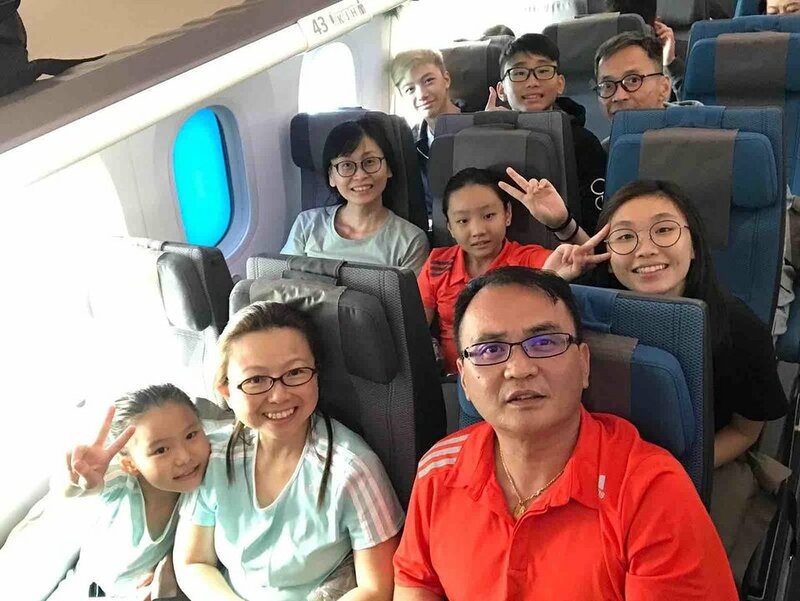 Every uncomfortable flight for economy class due to the reduced seat width (even for an asian with a smaller body size). Worst economy experience ever. Although an exit row seat it is obvious that to fit more passengers on the Dreamliner they have reduced seat size. Tray table flimsiest and smallest ever, seat hard and uncomfortable. Never again! Singapore Airlines flies 1 versions of Boeing 787-10.